You can add a SharePoint Document Library to Microsoft Teams for easy access to all your files right from the Teams interface. First, navigate to the Team you’d like the SharePoint library to be accessible from. Click the Plus button from the Tabs Bar and choose Document Library. We don’t want to use the SharePoint tile here because that will only allow us to link to SharePoint pages from the associated Team site. Instead, we want to link to a SharePoint document library from our organization’s shared SharePoint site. Wait for Teams to find sites from your organization or copy the link to your site directly from your browser. I’m going to choose Marketing because this is the Sales and Marketing Team. Then, click Next. From here, you can choose which document library you’d like to use, the site I’ve picked only has one, but yours might have more. You can only link to one document library per Tab on your Team page. Then click Next again. Here we can put in a name for the Tab in Teams, and we’ll click Save to add our SharePoint Document library. You can see that my new tab has popped up here. If I click on it, I see all the files I would see if I navigated to this document library in a browser window. I can click on any folder I want and use the breadcrumbs to return to different levels of my SharePoint hierarchy. If at any time I feel like I need to be working directly in SharePoint, I can click Open in SharePoint to bring up this page in SharePoint from a browser window. 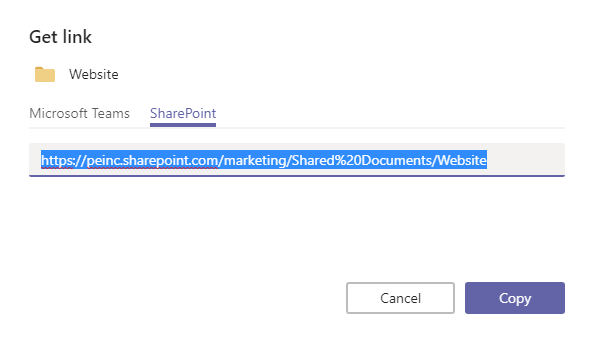 If I want to share the link to a file, like I would in SharePoint, I can select a document to share a link directly to that document or select nothing to share a link to that folder. I want a link to this folder, so I’m not going to select anything and choose the Get Link option from the toolbar here. 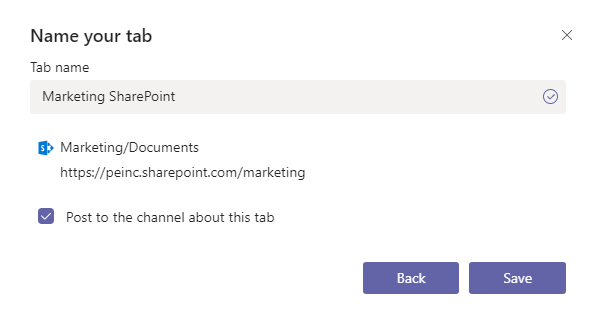 From here, I can get a Teams Link, which is a link to the file where it lives in this Marketing SharePoint tab of my Sales and Marketing Team, or I can share the link to it directly on SharePoint. That’s how you add a document library for easy access to your files in Microsoft Teams. If your organization is anything like ours, you’ve probably been utilizing a SharePoint document library long before you adopted Microsoft Teams. Microsoft Teams creates a unique SharePoint site for each Team you create, but what do you do about the SharePoint site your organization already has and uses? 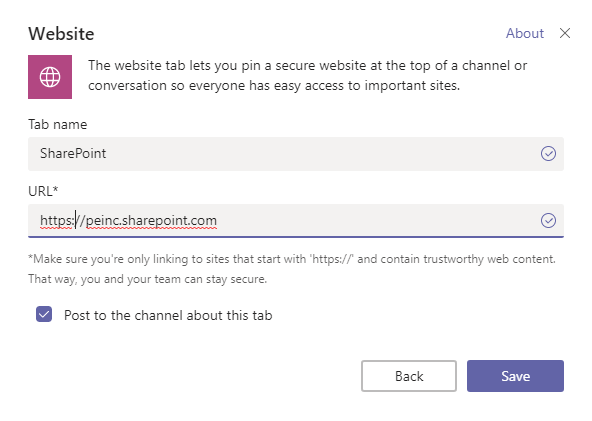 With Teams, you can easily integrate SharePoint sites for easy access—and I would argue that navigating SharePoint in Microsoft Teams is much more enjoyable than using your browser anyway. Note that what I’m going to show you here is just for connecting a document library to Teams, not your SharePoint site as a whole. I’ll include some information about doing that at the end. When you’re in a Team and click the option for Files at the top, you’re shown the SharePoint site created for that specific team. To view files in an existing SharePoint Document Library, you can connect the library to your Team in a tab. To add your preexisting SharePoint library, click the Plus button on the left of the Tabs bar to add a new tab. Then, from the Add a Tab flyout window, select the Document Library tile. If you select the SharePoint tile, you will only be able to connect to pages from that specific team’s SharePoint. Wait while Teams searches for relevant sites. If you are logged into your Office 365 Account, Teams will find the SharePoint sites associated with your organization’s SharePoint Site. Or, you can paste in the link to your company’s SharePoint directly. Select the site you want and choose Next. Then, choose which document library you’d like to connect to. You can only connect to one document library per tab, but you can always add more tabs as needed. Click Next. Give your new tab a name. I suggest including SharePoint in the title, so your colleagues know what they can find in the tab. When you’re satisfied, choose Save. Your new SharePoint tab will appear on the Tabs bar. When you click on it, you’ll be able to view all of your SharePoint files directly in the Teams interface –for what I think is an exceptionally improved experience over accessing SharePoint via browser window. You can navigate this area just like you would a SharePoint site by clicking on folders to open them and using the breadcrumbs at the top of the tab to return to previous levels. Use the New button at the top to create new folders or office files. Use Upload to add files from your computer. Right click on a file or use the Ellipsis icon for options like editing in Teams, SharePoint Online, or in the corresponding office application. You can also click Open in SharePoint to launch a browser and bring up the SharePoint location of that file. Whenever you’re editing a SharePoint or Teams file, you have the option share links to it from SharePoint or from Teams. Select a file to get a link directly to that file or don’t select any files to get a link to the folder. With your desired item selected (or not), choose the Get Link option from the top. From the flyout window, you can choose whether you want to copy the link to the document on your SharePoint Tab in Teams or to SharePoint directly. It’s your choice, but keep in mind where the permissions of your Team—likely more restrictive than your organization’s SharePoint permissions—will conflict. If you’re not sure, it’s always a safe bet to use the SharePoint link. 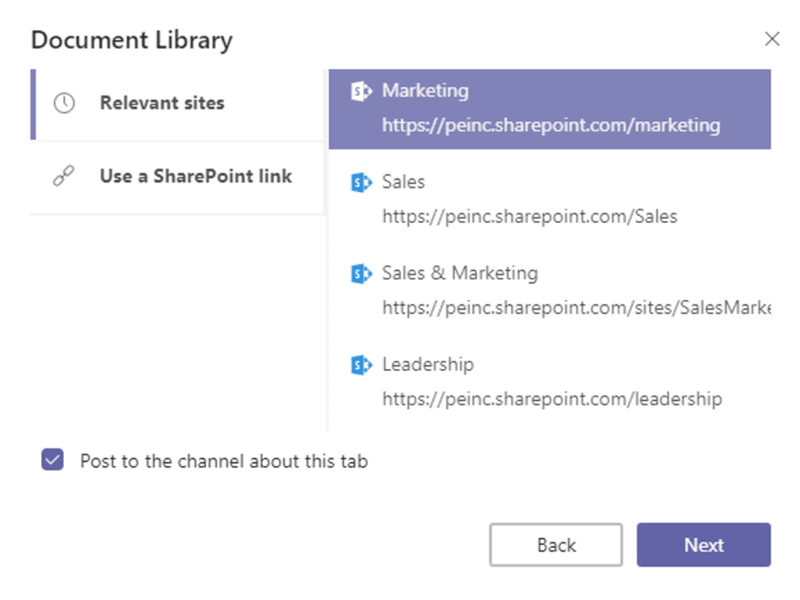 Want to Link to a SharePoint Site in its Entirety? Linking to a document library is a nifty tool for quick access to files and folders, but what if you need access to the entire SharePoint site? Click the Plus button to add a new tab and choose the Website tile. Then, copy and paste the link to your SharePoint site from your browser. Then click Save. Your SharePoint site will now be visible from Teams and appear exactly as it would if you were viewing it from a browser. PEI has been a Microsoft Gold Partner since 2005, and our engineers hold multiple Gold Microsoft Communications Certifications. We understand each organization’s Unified Communications journey is unique, and we deliver value by working with you to understand your business objectives and mapping out your technology to enhance these goals. Whether you’re looking to use Microsoft Teams as an online collaboration service or an enterprise-grade voice service with Microsoft Audio Conferencing (previously PSTN Conferencing), Microsoft Calling Plan (previously PSTN Calling), Microsoft Phone System (previously Cloud PBX) capabilities, PEI’s Microsoft Gold Communications Partnership makes us a recognized leader in delivering Microsoft Unified Communications solutions like Microsoft Teams (formerly Skype for Business Online). Watch this video or use the instructions below to learn how you can connect an existing SharePoint document library to Microsoft Teams for easy access to all of your files directly from the Teams interface.